Note: Most of these changes run for multiple weekends into March. Just as much as the users of the in Astoria for me next few weekends, QBL riders, and customers? Some people (like you) probably do suffer with the , but a few other changes make commuting worse. That's not to say that honestly these changes are so constant and see no end. It's almost every weekend with the . Its either reduced service north of 125th/Burnside, no service south of Brooklyn Bridge/Bowling, or full local service on Lexington. There is local and express shuttle buses. Express shuttle buses run nonstop between Kings Hwy and Atlantic ave Barclays center. Since the is running reduced service as well, they can’t suspend the completely and fit 5 pounds of horse manure in a one pound bag. Its actually easier for them to run two half-assed services instead of one quarter-assed service. Plus it saves them money by cutting service and keeping crews on the bench vs. calling up more crews for OT and beefing up any alternative services. Both trains will skip 74th st also. That one in particular is disgusting because it’s happening all 7 days of the week. We may have the and the BxM4 three blocks away, but still the really carries well on its own in spite of that. 1.Between Queensboro Plaza and Vernon blvd Jackson ave.
2.Between Times Sq 42nd St and 34th St Hudson yards. 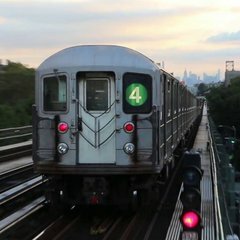 and trains run local in both directions between Dekalb Ave and 36th St.
train weekend work between Crescent st and Jamaica Center also happening during the weekend of the 23rd-24th of March. This likely has to do with the debris that fell from the structure and nearly killed someone. That was past 33rd St going to Flushing. Eastchester-bound trains will skip Gun Hill Rd. For service to this station, take the to Baychester Av and transfer to a Manhattan-bound *. For service from this station, take the to Pelham Pkwy and transfer to an Eastchester-bound . *Service runs between Dyre Av and E 180 St overnight. For service to this station, take the to Myrtle-Willoughby Avs and transfer to a Court Sq-bound . For service from this station, take the to Broadway and transfer to a Church Av-bound . @Dj Hammers Has this one been done before? This is an odd one. I presume they are doing work on the track in the station or between Jackson and Grand Concourse. For service to this station, take the to 3 Av-149 St and transfer to a Wakefield-bound . For service from this station, take the to Intervale Av and transfer to a Flatbush Av-bound . I haven't seen skipping Jackson as part of this change. When Manhattan-bound service is directed over to the Wakefield-bound track at 3 Av-149 St, trains must switch over to the express track just north of Jackson Av, bypassing the station. When the inverse occurs, Wakefield-bound trains can switch over to the proper track just south of Jackson Av, allowing the station to continue to be served fully. Between 125th St and Pelham Bay Park running every 12 minutes. Uptown trains skip the 138th St Grand concourse Station. Pelham Bay Park bound trains run express between 3Av-138th St and Hunts Pt av. *Mar 23-24, 30-31: No trains between Bedford Nostrand Av and Court Sq. *Shuttle buses connect with the 21St Queenbridge Station. Mar 23-24: Starting At 3:45PM Sat and ending at 10PM Sun, No trains between Metropolitan Av and Essex St.
service runs on a modified schedule because the and trains are sharing the tracks in Manhattan along Broadway in both directions. I litterally do not understand why the has to go via Broadway Local when theres already two local services on the track, it makes 0 sense. Because regular service makes s run local even without disruptions.